ROSEMARY'S BOOK CORNER: What Has Happened to our Polite Society? What Has Happened to our Polite Society? What happened to good old fashioned "Service with a Smile"? I think the beginning of this Century will go down in History as the age of Rudeness. Matters seem to get worse by the day. P's and Q's hardly exist and has anyone recently received a Thank you note from any young person to whom you have sent a card or gift. There are a few exceptions, of course, but as a general rule, you are lucky if you get a one line email. Just this week I have been ignored yet again when trying to pay for purchases at the check-out counter in my local supermarket, because the "lady" at the till happened to be having a long conversation with her friend at the next till. She could not be bothered to return my cheerful greeting, or to make eye contact with me. Not until I had said very loudly, "Are you going to serve me, or should I call the manager? ", did she deign to ring up the few items I had placed on the counter. She took my cash and handed me my change whilst starting up another conversation, this time with a packer. I believe that this sort of behaviour is not uncommon. Many people on talk radio shows have commented on it. Last week I had an appointment to see a doctor in a fairly large hospital. I arrived a little early, knowing I would have the usual forms to fill in as a new patient. On entering Reception, one lady behind the counter was eating a sandwich and had a mug of coffee in her hand, which she used, without a word, to point me towards the opposite counter. The lady there was sucking a red lollipop, which she did not remove from her mouth for the entire time it took her to take my name and give me the necessary forms; to ask for my I.D. Book and Medical Aid card, which she took away to photocopy. She handed the items back to me with a "lollipop-in-mouth" smile, stick bobbing up and down and that, as the saying goes, was that. Two weeks ago I was in a long queue at the Post Office. I counted 21 people, all waiting to be served. There were five empty counters. One elderly lady asked whether there was a strike on, or if their staff were off "sick"? "No," came the reply, from the one and only person trying to get through all the customers, "They are all on tea". "How can this be allowed? Where was the postmaster? ", someone else asked. "Gone out". Was the curt reply. And with that three of us walked out. Have you noticed how no one returns calls these days? How one is kept holding on for ages, only to be told that the person you need to speak to urgently, is in a meeting? Is that all anyone does these days? Attend meetings and then NEVER return calls? Shopping is no longer the treat or a pleasant experience it was when I was young. There is no one around to help you and if you should be lucky enough to find someone eventually, they are so disinterested, you almost feel sorry to have bothered them. I could go on and on - rude drivers; inconsiderate cyclists; etc; etc. Perhaps I should end with one last piece. On a recent trip to the Cinema, I asked for two seats near the back on the aisle. "Sorry, I can't do that," said the young man serving me." I can give you 5 rows down." I sighed and took the tickets, only to find, as the lights went down, that there were only 3 other patrons besides us, in the whole place! Takes the cake, doesn't it? Marianne wrote: "interesting...not so sure what the reasons are, though. i can also see young people that are very polite and elder people that are not. i have seen though, that cultural background and upbringing matters alot. prob. also the general conduct of society - what people consider to be normal and act according to it. i can remember that 10 years ago people would wait until the people got out of the train or bus until stepping in. nowadays its like fighting for a place and people no longer wait for each other to go in nor out." Polly wrote: "Its everything- from job searching to shopping to just polite conversation on the street. People no longer stop to say Hello - they ignore their friends even!" Sad it is indeed. As I recall, ettiquite was a required course for young ladies to take. Would be nice to see its return. In the meanwhile, a polite smile and a diplomatic comment work nicely. So does a good size tip before being served, along with a comment of "I know you will take care of this nicely for me. So I am giving you a tip ahead of time.". 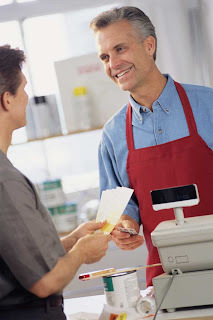 Next time that person sees you, you certainly will have service with a smile. HOW TO CHOOSE THE RIGHT SCHOOL FOR YOUR CHILD.